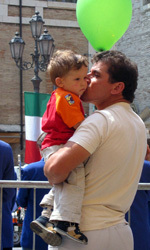 In 2005 the Festa della Repubblica was celebrated in Cagli for only the fourth time, but the celebration of the birth of the republic of Italy has always had an impact on the residents of the small hillside village. The Festa della Repubblica takes place all across Italy to celebrate founding the Italian Republic in 1946. 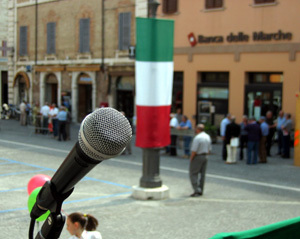 In Cagli, the townspeople gather on the main piazza, Piazza Matteotti, and take part in the festivities, which include a procession of officials and flags, a marching band, a speech by Mayor Domenico Papi, and a release of green, red and white balloons by the schoolchildren present at the ceremony. The piazza was cleared of the cars that normally occupy the space surrounding the fountain as the citizens of Cagli stood off to the side. Children walked and played, while some were carried red, green and white balloons, to be used later in the ceremony. 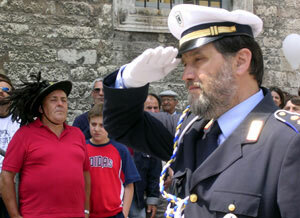 “It’s a good thing the Festa has been established as a national holiday on the second of June because the fact that Italy is a republic is very important and should be underlined,” said Massimo Ciabocchi, the head of the civil protection force or protezione civile. Originally, Italy had been unified as a kingdom in 1861, without Venice and Rome. Venice and Rome were included in 1871, with Rome as the capital, and the entire peninsula became a united nation. After World War II, the Italian people were given the opportunity to vote whether they wished to be a kingdom with a monarchy or a republic with an elected government. On June 2, 1946, the Italian people voted in favor of a democratic Italian republic. The celebration of this event in Cagli begins with a procession into the piazza, which has seven Italian flags hanging in it: three from City Hall and another, the largest, hanging from the platform from which the mayor makes his speech. 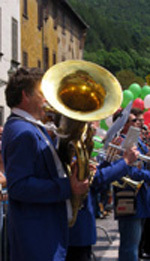 The marching band in their blue suit jackets leads the procession followed by the mayor of Cagli and mayors from Acqualagna, Cantiano and Piobbico. Numerous uniformed forces were represented in the ceremony as well, lining the square in front of City Hall. After everyone marched in, the Italian flag was raised as the marching band played the Italian national anthem. After his speech, the schoolchildren released their balloons into the sky, representing the freedom Italy experiences existing as a republic.